Saturday was our first day filming the Ferry Plaza Farmers Market in all its glory. It was a big day. It was a brilliantly sunny day. It was Goat Festival day. It was invigorating and fascinating and exhausting. It was a snow globe kind of day – it turned me upside down and shook me around and things swirled around that I hadn’t ever noticed before. On Friday night, in an effort to prepare myself for the Saturday shoot and channel all things goat, I baked what is best described as a crustless quiche wonder. 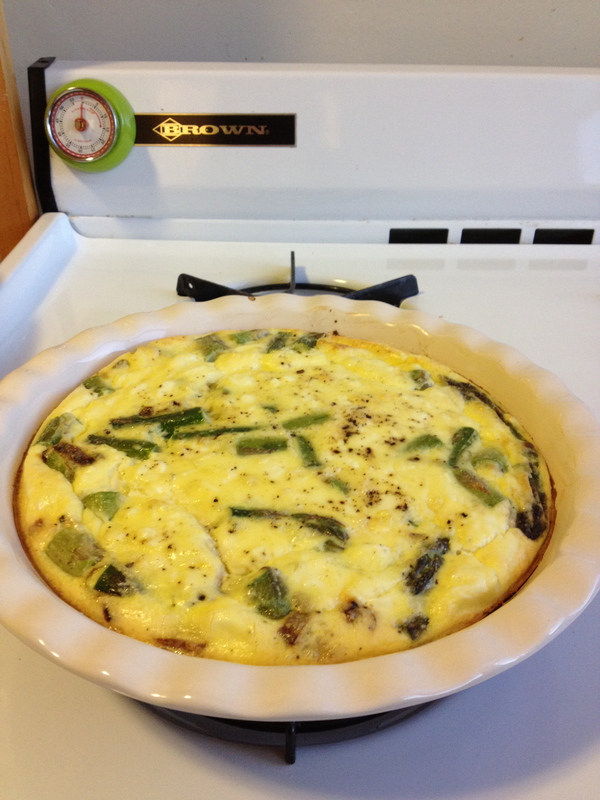 It was really good and goaty – asparagus, leek green garlic and crumbled goat cheese topped with a mixture of egg, ricotta and cream, baked to firm and golden. Anna brought spring salad fixings. We opened a bottle of rose. We ate and sipped and talked and sliced off seconds from the pan, then topped it all off with spoonfuls of LaLoo’s Rumplemint goat ice cream straight from the pint. On my way to the farmers market on Saturday morning, I double parked in front of my favorite neighborhood coffee shop and popped in to get a latte. 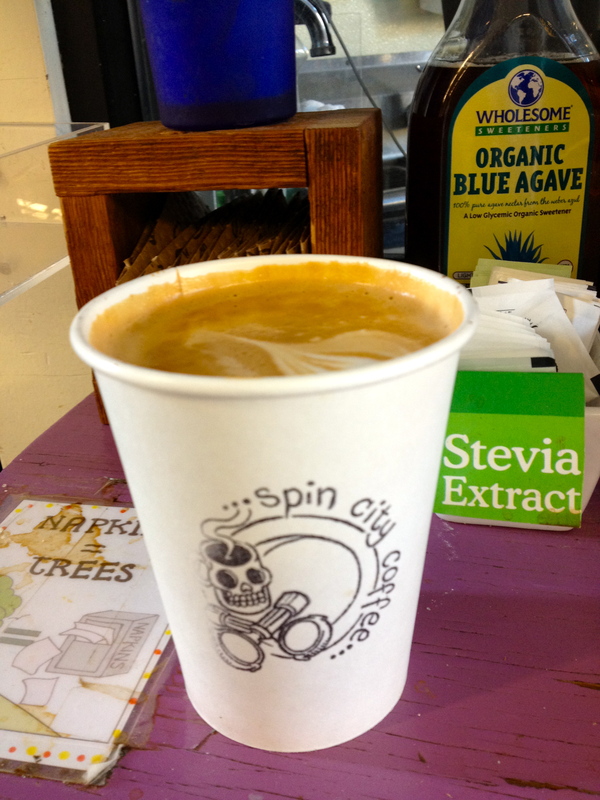 Not just any latte. A goat milk latte. And then before I knew it, it was GOAT TIME! I interviewed local farmers and goat product purveyors and sampled more delectable goat goodies than a gal could dream of – aged goat cheese, soft chevre, scotch caramel sauce, kefir, fudge and more. Every single one of the folks I spoke with were passionate about the products they make, making my job so much easier. It also helped that I love all things goat. We’ve got history, goats and me. I admit there were times when I was farming in France – desperately pleading, swearing, yelling at the goats to move along and stop eating the neighbor’s oats, or chilled to the bone making goat cheese in Jean Yves’ stone-walled cellar room for hours on end – when I would have been delighted to never, ever set eyes on a goat again. But, like most thoughts born out of frustration, it passed. My love for goats has only grown since my farming days of yore. 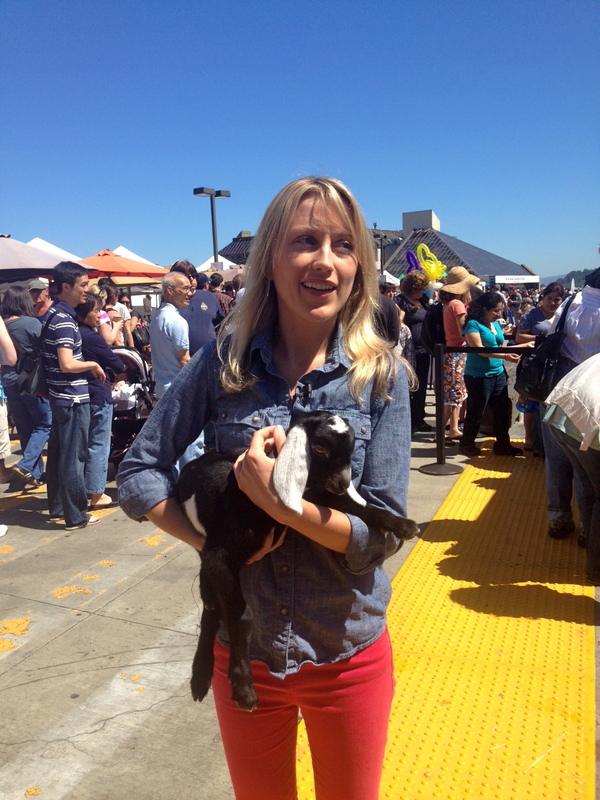 I held a one-week old baby goat from Redwood Hill Farm while we filmed the intro and sign-off for our goat episode. I needed more than a couple takes to get it done. (Let me tell you, this hosting thing is not as easy as it seems!) By the time we wrapped, the poor little goat was sweltering in the sun and I couldn’t tell if she was sleeping or semi-conscious. But, we had done it! The goats, the farmers, the crew and me…we are Fresh from the Farmers Market! 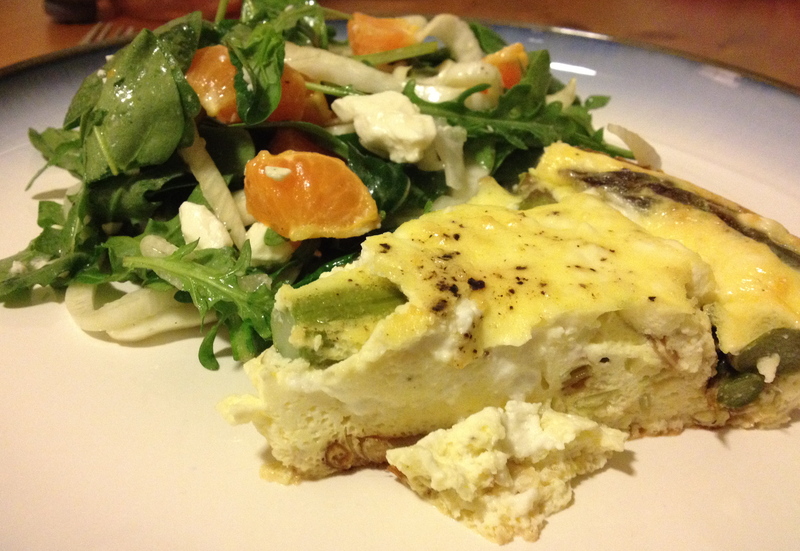 And now for that good and goaty crustless quiche wonder I’ve been telling you about. The best thing about this dish is that you can eat it for dinner with a salad and bread or roasted potatoes, slice off a wedge for lunch on-the-go, or eat it for breakfast with coffee. It’s versatile like that. And you should feel free to swap out the asparagus for a different green veggie. Sautéed chard or kale would be delicious. Heat 1 1/2 tablespoons olive oil a medium skillet over low heat, and add sliced leeks and green garlic, stirring to coat. Add a pinch of salt. Cook leeks and garlic slowly, stirring occasionally, until they turn light golden in color. 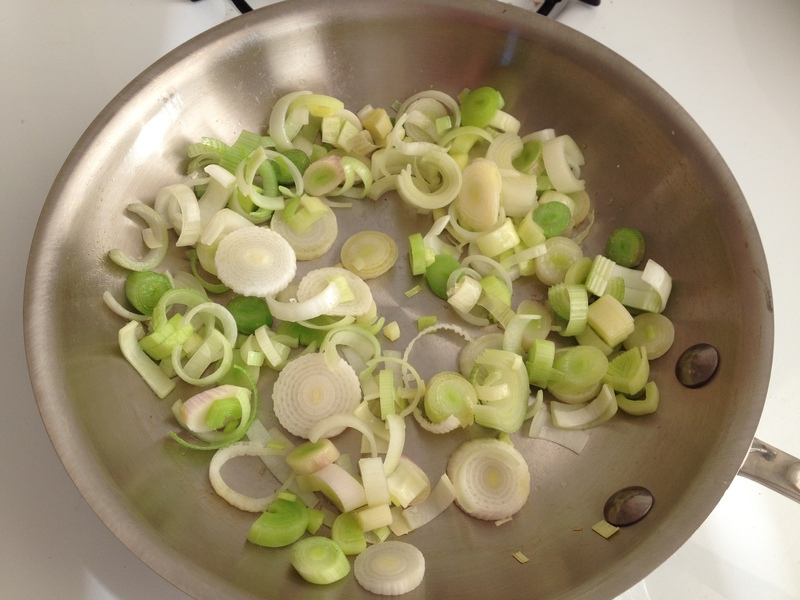 While leeks are sautéing, butter a 10-inch round baking dish or pie tin. Once leeks are ready, pour them into the buttered dish. Add the blanched (they should be bright green and crisp), chopped asparagus and arrange the goat cheese crumbles evenly on top. Sprinkle lightly with salt and pepper. In a large bowl, whisk together the eggs, ricotta, and half-and-half (or kefir, if using). Add a big pinch of salt and few grinds black pepper, and stir to combine. 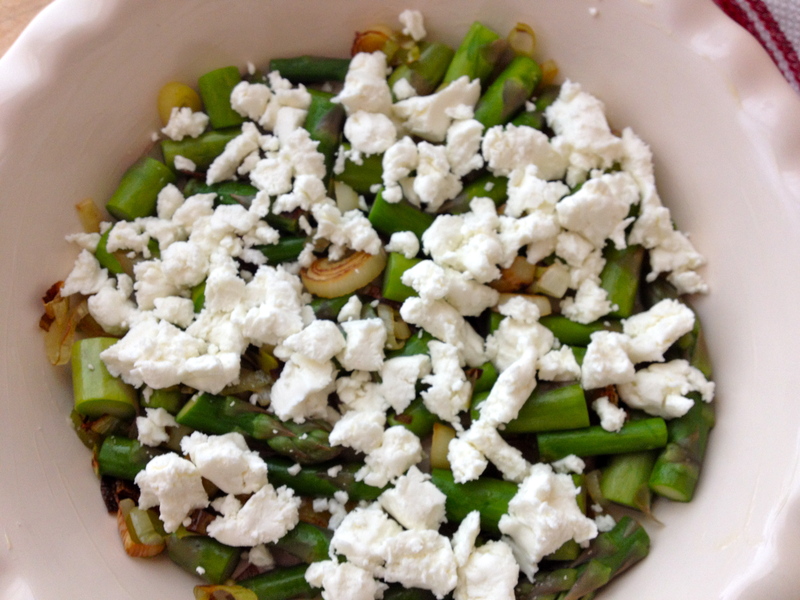 Slowly pour the egg mixture on top of the asparagus and goat cheese, until the baking dish is full. Finish with an extra grind of pepper. Place the baking dish on a sheet pan if the dish is really full, just in case the eggs run over in the oven. Baking time depends on the kind of dish you’re using but could be anywhere from 30 – 45 minutes, until completely set in the center and golden at the edges. Serve, sliced into wedges, warm or at room temperature. Oh my goodness, I need to go get some goat cheese right now! Love you, my shining star! so many goats around this messy town… we need a La Cocina-like incubator and your culinary talents. 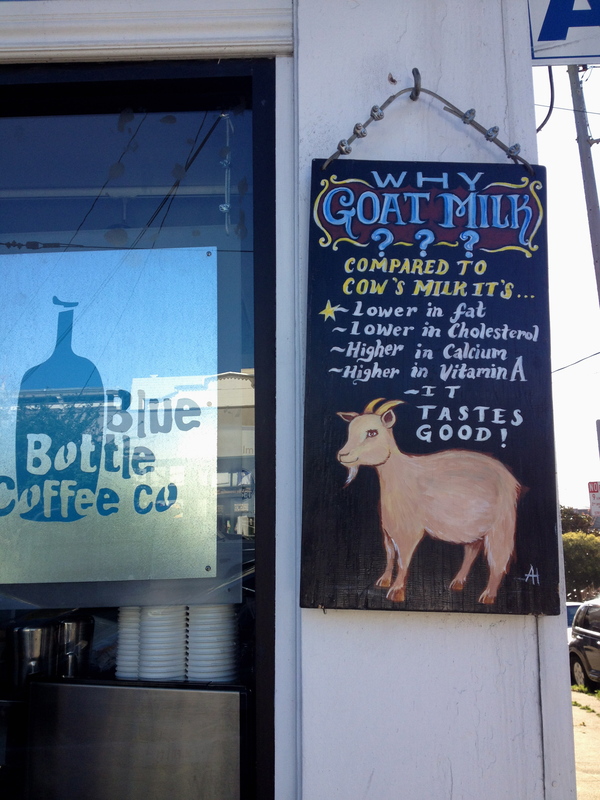 but a goat latte… truly tasty? Truly tasty! Yes. I’ll buy you as many as you’d like next time you visit. And, I think you’re on to something. Haiti needs a La Cocina…and so much more. Keep doing all the incredible things you do, mi hermana linda.